creative savv: So, I've been sorting through my sewing closet . . . So, I've been sorting through my sewing closet . . .
A fast and easy little Saturday project. My sewing closet. . .
Gee, is it a mess in there. My sewing closet is actually the guest room closet. When we have overnight guests, I have to stash some of the stuff elsewhere, so our visitors can have a bit of room to hang garments. This winter, I've decided to tackle this closet and get it looking halfway decent. I'll settle for halfway at this point. But the thought of just plowing through it all in one afternoon is not very appealing. I'd likely throw out bunches of usable fabric scraps and worn clothing that still has life. So instead, I'm taking it on, one week at a time. Once per week, I am going through the lot and picking out one item that I can re-purpose. This week, it's flannel pjs. These pjs have been scavenged for fabric once before (hence the half leg missing), when patching a flannel lap throw (aka baby blanket, still a favored item) for one of my girls. So, they are already pretty chopped up. What do you think flannel would be exceedingly good for? It makes cozy clothing, bedding, liners for tea pot cozies, and. . . . . . I thought about just cutting these pajamas into squares, leaving them unhemmed. But I know in just a few washes they'll fray and make a mess of the laundry. Rolling the hem sounds too tedious for this. 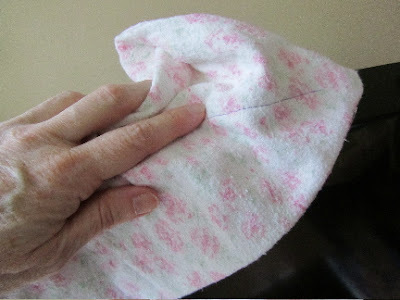 After some thought, I opted to make these dusting cloths double-layered, trapping any fraying ends inside, like a little pouch. After cutting the pjs apart along seam lines, I found I have enough usable fabric to make a 14-inch square, double-layered cloth. I cut two 14-inch squares. With right sides together, I sewed 3 complete sides, and 1 almost complete side (leaving about a 3-inch opening to turn the pouch right side out). I turned this right side out. 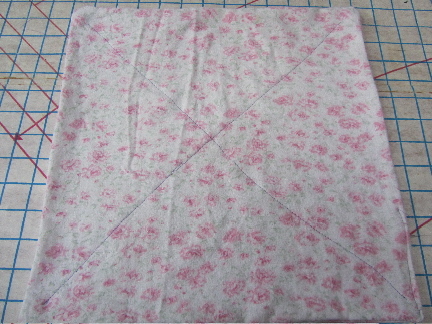 Last, I stitched a large X diagonally across the square, to hold it all together in the wash and dry. 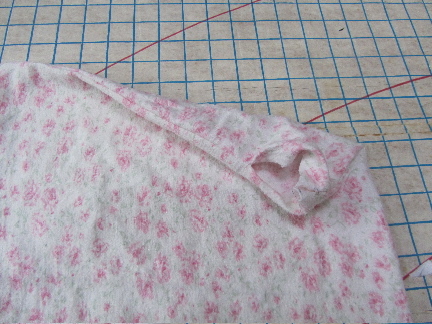 Voila, one very soft dusting cloth, and just a bit less junk in my sewing closet. What's next for this coming week? I'll have to see what strikes my fancy. What do you do with too worn clothing? A tip for cleaning electronics, which draw dust to themselves -- if you use dryer sheets or liquid fabric softeners in your laundry, they can help repel dust on electronics. A used dryer sheet can last through several dustings. A few drops of fabric softener on a cloth will also work. If you enjoyed this post, consider subscribing to creative savv. I'd love to share more about my creative and fun-filled life with you. Some of it I save, like old jeans, or at least a leg or pocket from them because denim is always useful. Also, I recently discovered that our recycling center has a spot for old cloth. I don't have room to hang onto everything, so I recycle some of the too worn clothes. That's good to know about recycling centers taking cloth. I'll look into that. We give away clothing that I think could benefit someone, but hang on to the raggy stuff, hoping to find a use for it. Thanks for the tip on recycling centers for old cloth. I also cherish worn flannel, making dusting rags out of it. I cut down worn out flannel nighties for pillow cases (Lanz are quite generous, and can usually fashion at least one pillow case, with the remaining fabric earmarked for rags). I also discovered that if cut into thin, narrow strips, flannel (and wool) makes a great filling for draft dodgers, eliminating the need to purchase polyfill. those Lanz nighties have sooo much fabric in them. I can easily see a pillowcase coming out of one! Great idea for the strips of flannel and using as stuffing for draft stoppers. Even with my sewing these pjs into things like dusting cloths, I've got all those random bits remaining. And they'd make good stuffing. Thanks. I love how well it picks up dust. And so soft on my winter-worn hands. And of course, I love using things up, to the very last bit! As I know you do as well. I love your new cloth, I am so lazy that mine have been cut up but never hemmed them. I like to use flannel to patch knees of stretchy pants for little ones, I cut them into shapes and sew on the hole, they become the favored pairs. I like the idea of using nighties for pillow cases, I finally pulled out my flannel sheets yesterday as I was so cold, don't know why I didn't pull them out sooner it's a wonderful feel to sleep on flannel. When my kids were young, I'd patch their pants with whatever fabric I had, and they, too, became the favorite pair. So, I was thinking just now, how funny it is, that as adults, we would look at the patched pants and see "old and worn", but kids would look at them and think "fun". If we could just adjust our way of thinking to that of a child. And I, too, also love sleeping on flannel. It is so cozy to slip between on a cold night. Oh, flannel...how I love the feel of it! We are very fortunate to have a nephew who does mechanic work. He is always looking for rags anywhere he can find them...he scavenges every yard sale in the area and still cannot meet the demand he has for rags. Now there's an idea, bundle all the clothing that's too worn to wear, and I can't think of a use for, and use next summer's garage sale or Craigslist to find someone who could use it for rags. At a garage sale I could put it all in my free pile, bundled as rags. You're right about how useful flannel is. 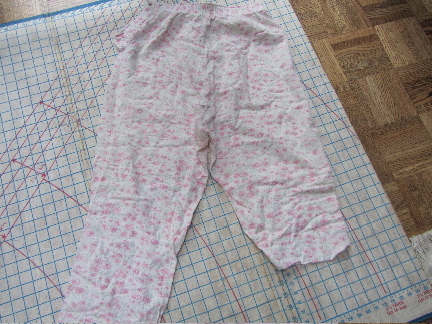 I already have ideas for the remainder of those pj bottoms! I agree about the rags. I worked at a yard sale once for a charity, organizing all the clothes donations. There were a lot of stained and worn T-shirts which were sold "by the bag" and people were thrilled to be able to buy them! That's so interesting that people would buy bags of old t-shirts just for rags. In past yard sales, I've only put out things if their condition were so that I would buy it, if I needed it. I'm going to have to try bagging some of the clothes up to sell for rags.